Perhaps you've seen the Mitsubishi i-MiEV before. It's a little Kei-sized vehicle that's all electric. 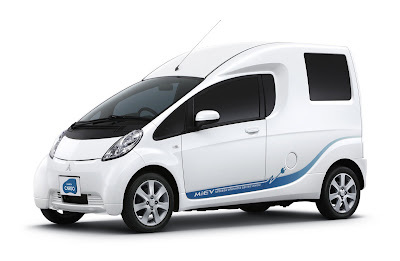 Now, Mitsubishi is coming out with a cargo-carrying variant of the pint-sized EV at the Tokyo Auto Show. The i-MiEV Cargo has a cargo area that' 53" x 46.5" x 43" and has a completely flat floor. The vehicle's overall length is just 133.6" long, or about 16" shorter than a Toyota Yaris. "i-MiEV Cargo"? Why not "i-MiEVan"?